Satori is an audiovisual performance project by Félicie d’Estienne d’Orves and Etienne Jaumet. It was created in 2013. Félicie d’Estienne d’Orves was born in 1979 in Athens. She lives and works in Paris. Through her videos, sculptures and projections, she has been researching for many years on the process of vision and its conditioning. Manipulating video light as a painting, the artist projects and inflects it on sculptures. 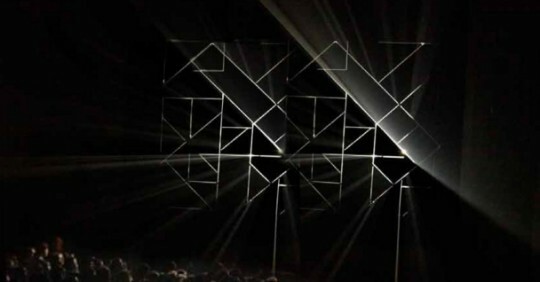 She created her first video mapping pieces in 2000, she uses physical material, still lives and folded papers (Origami series) as reflectors on which she casts illusions of shadows or colour shadings that act as a trompe-l’oeil. This processing of light projected on sculptures that are used as a “screen” introduces equivocal relations between what is visible and what is not. Physical experience and interaction are inherent to her creative process, in which she involves the viewer’s own body in relation to the artwork. With its kinetic characteristics, the object of art triggers cognitive engagement. And Etienne Jaumet? You only need to see him once on stage, shimmering and tense, surrounded by analogue machinery, synthesisers, sequencers and drum machines, to then recognise him anywhere. With Etienne being one half of Zombie Zombie, the band’s first album is still its last. Until they record a second one (the other half of Zombie Zombie is busy with his other band Herman Dune), Etienne Jaumet has embarked on a passionate new adventure: making music on his own, with his instruments as only companions.